Venturo offer a relaxed, friendly and Professional Service within a light modern and well equipped salon, with the added advantage of ample free parking.We offers trendy haircuts and color services, complete skin and hair care solutions and bridal packages, at affordable rates. Venturo's commitment is to bring out your authentic beauty, define your style, and create desire. Beauty is the giftof God and transmitted from one to the other generation. 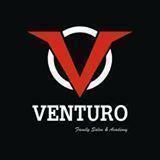 Venturo academy conducts classes in Hair Styling and Makeup. It is located in Himayatnagar, Hyderabad. It takes Regular Classes- at the Institute.